HE is the brains behind interactive murals in the Newcastle Beach tunnel and the city’s museum and now artist Trevor Dickinson has landed a 15-foot shark at the Mayfield Pool. The artwork, commissioned by Newcastle City Council, took Mr Dickinson eight days to paint on the southern wall of the swimming pool. 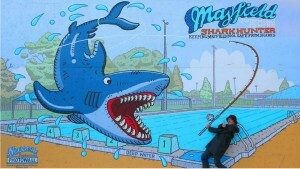 He got the idea for the large cartoon shark after painting a green dinosaur at the Newcastle Museum, one of several interactive artworks including a skateboard, motorcycle, mayoral chair and the popular ‘‘the most attractive couple in Newcastle’’ piece which adorn walls in the Honeysuckle precinct. ‘‘The brief was to include the pool in it but I thought rather than just use the pool I wanted to draw a big shark, so I squeezed both in together,’’ Mr Dickinson said. ‘‘The idea for interactive murals came after I saw people posing with other artworks like the ice cream van and the shower in the tunnel at Newcastle beach.